I am very pleased to share that our first-time Innovation Theater has been a huge success. I am proud to be a member of the AAOS Exhibits Committee and the chairperson for the Innovation Theater Sub-committee. Presenting my ” Nerve Conduction Studies in Surgical Cubital Tunnel Syndrome” at the American Society for Surgery of the Hand, Boston MA. Avocado, the green-skinned, egg-shaped fruit, is getting more popular than ever. With it, there are increasing reports in media and medical news about avocado related hand injuries . Accidental knife injuries happen to fingers of the hand holding the avocado while peeling it. Such injuries has increased to the point that is they have been named ‘ Avocado hand’. The hard shell covering a soft fruit allows the knife to slip through the flesh of the avocado and aim straight to ones fingers. The best way to safely cut the avocado is not to hold it in your hand, but on a plate and aim the sharp edge of the knife away from your fingers. This can lead to serious injuries such as cut tendons, nerves, and blood vessels. Ir Med J. The Avocado Hand. 2017 Dec 18;110(10):658. I am glad to share that WVU Medicine cut a ribbon at the new Fairmont facility on Sept. 22. A photo gallery from the ribbon-cutting ceremony is available on CONNECT. The $13.9 million, 25,000-sq ft. outpatient center is located off Downtown Fairmont Exit 136 of I-79, near the Fairmont Gateway Connector. I am pleased to be part of he Fairmont clinic team providing Hand, Elbow, shoulder orthopaedic care to the residents of Marion county and surrounding areas. new building and providers, a community open house is planned for Saturday, Oct. 21, from 10 a.m.-2 p.m. Watch for more details. 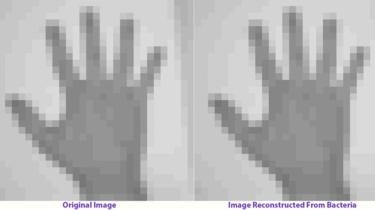 The image of the human hand encoded in DNA! Researches chose the image of a human hand, representing the first form of human painting, to be the first DNA encoded image in a living form! They inserted DNA sequences that represent the image into the genome of bacteria. Later, They decoded the sequences into an image using a computer algorism with at least 90% accuracy. Gloves played a substantial role in the conduct of human affairs and social interactions beyond keeping one’s hands warm and protected since ancient societies. Early Egyptian Pyramids contained hand covers without fingers. The tomb of Tutankhamen had the remains of decorated gloves. Leather gloves were popular in the 1100s. Sturdy leather gloves were worn by laborers, falconers, and knights, whereas fashion gloves were crafted of fine leathers such as doeskin and lamb. Scented gloves were developed in the 1500s. Chicken skin gloves were worn at night to keep hands soft and white. Fabric gloves crafted from silk, satin, velvet, cotton, and linen were stylish in the 1500s. Gloves had a variety of symbolic uses. The delivery of a glove to a monarch at an inauguration ceremony symbolized recognition of the new authority. Nobles received a glove when knighted. Bishop status was granted by the delivery of a glove as well. On the same token, Knights conveyed defiance or launched a challenge by casting down their war-gloves (gauntlet). Gloves were used as messages of good will between sovereigns and dignitaries. They were sent to wish a person well, to congratulate them, or to console them. Gloves were also used for binding a bargain or as a bribe. Gloves were a token of love. They served a knight as an everlasting reminder of his love, inducing him to courage, loyalty and constancy while away. It also served as a charm against evil during conflict. Today, gloves are practical articles that warm and protect our hands. People continue the tradition of wearing gloves at funerals, weddings, state functions, formal events, and the opera, as gloves maintain their symbolic value and fashion statements. Washing your hands- straightforward, or is it? There’s plenty of evidence that washing one’s hands can reduce the spread of disease, only 5% of people wash their hands ‘properly’ ‘all the time’. 10% of 3000 people were witnessed leaving public toilets without washing their hands, and of those who did,33% didn’t use soap. While it is well established that we need to wash our hands properly, there are plenty of myths about what is proper. Does the water need to be hot to get your hands clean? In a survey of 500 adults, 69% believed that the temperature of the water has an impact on the effectiveness of hand-washing. Researchers found that water temperature made no statistically significant difference when other factors are controlled. Temperature still affects washing, though, because excessively cold or hot water lets people spend less time washing their hands than comfortable water temperature. Is anti-bacterial hand wash better than soap? A 2007 and a 2015 review both concluded that anti-bacterial hand washes did not reduce the number of bacteria remaining on people’s hands after washing any more than soap did, nor was it any better than soap. Triclosan, a main ingredient on most antibacterial hand soaps, May increase anti-bacterial resistance and that and has been banned in the US and in the European Union. Do you need to dry your hands afterwards? Letting new hands air-dry is fine as long as he did not contaminated hands before they try out. Durkan’s transfer to your hands more easily if they’re wet. Hand dryer or hand towel? There’s a lot of debate surrounding this one. Most of us don’t want for as long as 45 minutes needed for the hands to dry using hand dry. New were hand dryers take 10 seconds hand and our equivalent to paper towels. Making toilets nicer also makes a difference. One study observe 3,000 people in the US, found that if the toilets were clean and well-kept, people were more likely to stop and wash their hands properly. When the sinks were dirty, they just wanted to get out of there. Whichever way you choose to wash and dry your hands, do it for longer than you think. I am happy to be part of the American Academy of Orthopaedic Surgeons’ CPG for the Rotator Cuff. The Carnegie Science Center‘s Roboworld exhibit in Pittsburgh PA features a giant mechanical hand. You can move its individual parts using a computerized controller. If you are into Robots and / or Mechanical displays, this is the place to go to. Everyone has experienced that tingling sensation in the hands. It is commonly called “pins and needles” because it feels like tiny pointy needles. Some describe it as numb, or “falls asleep,” and is uncomfortable to place pressure on it. The sensation itself is called “paresthesia,” or alternate sensation. Sensation is transmitted from your body to your brain via nerves, your biological Internet cables. If you place too much pressure on one of them, the signal gets distorted. We call it Neuropathy, ie sick nerves. Once the pressure is relieved, it goes back online soon. If the pressure is not removed within reasonable time, it causes permanent change to the inner structure of the nerve and permanent change to the signal. More severe and long standing pressure can cause permanent loss of signal even. There are several nerves in the arm, and each may be subject to pressure at several spots. For more info, check the Numbness and Tingling page. 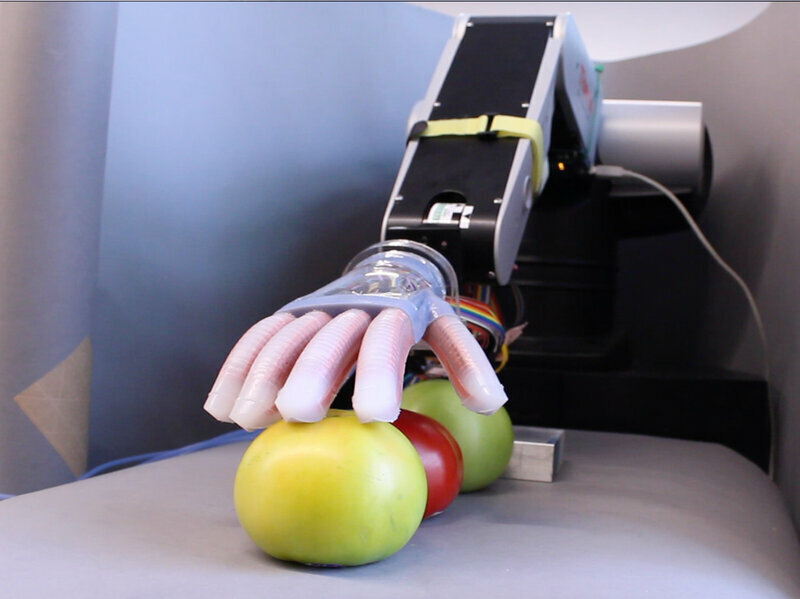 Cornell University just made a robot hand with a soft touch. it is not just soft, but it can also sense the shape and texture of what it comes into contact with. Welcome to the growing field of soft robotics. For more information about soft robotics and their development with human interaction, follow this link. Today is my official first day as a full-time faculty at the West Virginia University Department of Orthopaedics, at the rank of Assistant Professor. 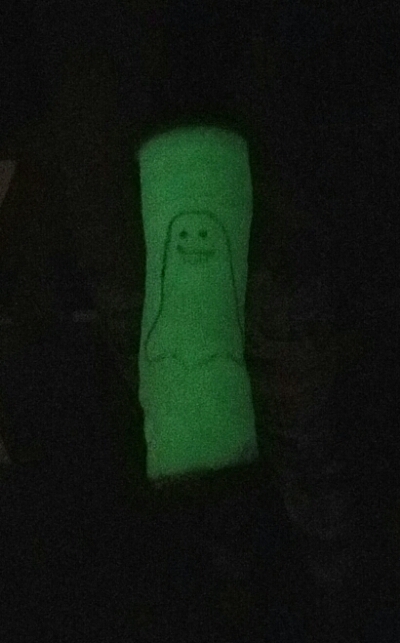 My young patient had a happy surprise when she realized her cast was a glow-in-the-dark ‘ghost’ cast. Harry Potter fans know very well that witchcraft can be dangerous. Harry broke his ‘arm’ ( in reality, it was both-bone forearm fracture) during a Quidditch game and was ‘doctored’ by Professor Lockhart. The spell he used, Brackium Emendo, did not work as intended: instead of healing the bones, it made them disappear. Harry was then taken to the Hospital wing and treated with Skele-Gro, an awful tasting potion that grows missing bones. This is a Sports injury! Should Quidditch players not wear protective ‘armor’? Can this spell truly heal broken bones instantly? No cast! No Surgery! No down time! I should go spend sometime at Hogwarts. Oops. The spell did not work after all. On top, it had the unintended consequence of missing bones: a Complication. The ‘Doctor’ did not explain the treatment ( the spell itself), its risks ( missing bones), other alternatives ( let it heal with a cast), and did not get consent for treatment. In fact, Potter did not want him to cast the spell! In our world, it is an easy law suit! The ‘credentials’ of the ‘doctor’ were suspicious to start with. Was he Witchcraft-Certified? even better for the law suit. Skele-Gro was used to reverse the complication. Where can I get one? Would it work on stubborn fractures ( nonunions) and missing bone fragments? Yet another reason to visit Hogwarts. Paper, seemingly completely harmless, can be a weapon in disguise: paper cuts hurt way beyond expectations. It’s all to do with nerve endings. There are a lot more pain receptors in your fingertips than almost anywhere else in your body, which explains the intense fiery quality of finger paper cuts that are worse that than deeper cuts on the arm or the thigh. They don’t slice that deep into your body, which is perhaps why it’s puzzling that they should hurt so much. But it’s exactly for this reason that paper cuts hurt bad. A deeper wound would result in bleeding. The blood would clot and a scab would develop protecting it from the environment. The shallow wound of a paper cut doesn’t get the same cover, leaving the injured nerve endings exposed and more irritated. Having said that, nobody has ever proven that this is the case, but it is a reasonable hypothesis. Don’t you agree? Lucy, the famous 3 million years old hominin, has been a mistery for the last few years: how did she die? A group of orthopedic surgeons were asked to review recently obtained 3D CT scans of her skeletal remains and recognized something we are all too familiar with: fracture patterns of the shoulder and other bones that we see with high energy injuries in humans. Those were fractures that happened just before and led to her and not bone breakdown that happens to bone fossils. ​I just attended the feature presentation by author Sam Quinones at the WVSMA Healthcare Summit. He describes how aggressive promotion of highly a addictive painkiller and the development of cheap underground heroin production, marketing, and delivery industry led to the current opioid epidemic. The book won several awards including Amazon’s Best Nonfiction Book for 2015. Sports related injuries can be the result of a single trauma or due to repetitive overuse. Certain sports such as boxing, basketball, and volleyball have greater risk of injury to the bones, ligaments and muscles of the hand and wrist. One common injury is a boxer’s fracture, which is a fracture of one of the metacarpal bones: it happens when your punch lands wrong. Basketball and volleyball players frequently get ‘jammed’ fingers. This happens with a forceful encounter with the ball. There may be visible misalignment of the finger. A jammed finger can be anything from an innocent sprain to a bad fracture-dislocation requiring urgent surgery. Looks can be deceiving and these injuries should never be underestimated.It is easy but costly to dismiss a serious injury. If pain and swelling do not go away in reasonable time, you should seek medical attention including proper x-rays. Appropriately sized, and well applied hand wraps and/or gloves protect the hands from such injuries, and proper training is essential to prevent such injuries. Some of these injuries come with an easy fix while others require surgery and dedicated hand therapy. While still recovering, you may still work on staying in shape and game ready by running, working on lower body and strengthening your core.Your treating physician, together with your therapist, will set the schedule and time frame towards full use and will let you know when it is safe to start exercising your injured hand.If you do too much too soon and push through pain, you may be delaying your recovery or reversing the outcome of your treatment.